You now must have your CustomWorks II software registered before installing updates. If you have not registered your CustomWorks II software and you try to install this update, you will receive this message. 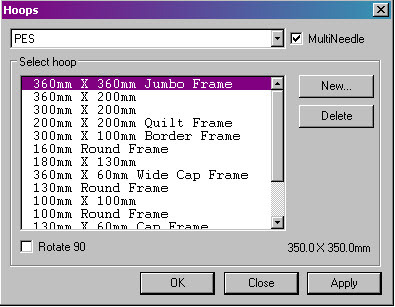 The available hoops list now has a listing for both single needle and Multi-needle machines in PES format. LetterWorks III update now works within CustomWorks II. Moved the Stop sign closer to the tools. Some Operating Systems would not show the Stop Sign even when changing the screen resolution. When using merge, cut, or copy/paste with a .blf file, sometimes a color would split. This has been corrected.